If sludge metal isn't enough demoralizing, why not mix it with doom? Most bands in this style doing the same partly for the heavier effect, and partly because this offers them wider perspectives. In the case of Corrupted, the first could have been the main reason. Their music counts very exaggerated even in sludge/doom, and they are probably one of the most demoralizing and audience-unfriendly bands ever. 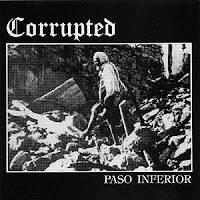 "Paso Inferior", their full-lenght debut included only one album lenght song. To extent a track like that points through on the ordinary concept of the style. It's not the noisy sound that is assisting to the simple, raw themes to increase their effectiveness... it's only about the noise. The lyrics are Spanish, that may sound weird from a Japanese band, but for a so slow music like this, no long lyrics are needed, and anyway it's only about one song. In truth Corrupted is like the musical version of dadaism, to deny every rules that may be important in music business. There were similar ambitions in plenty of genres, but none of them were so authentic like this band. Unpopular style and concept, uncommon language selection, noise in focus instead of themes (or melodies, but yeah, even to name melodies may sound folly), exaggerated demoralizing in extented lenght, no promo pics of the band, no importance of image or visual designs. So to think again what rebellious ambitions could mean in music, may sound reasonable. Like most Japanese bands, they are also known about their productiveness, so the lovers of extreme demoralization can chose from plenty of Corrupted materials to set up their gloomy days.